Our small corner of paradise is located on the seashore, in the heart of the village of Cap Malheureux, on the northern end of Mauritius Island. Cap Malheureux is a much appreciated seaside resort all year long. For approximately thirty years, we have developed a great experience in caring for the tourists and guests who choose to rent the Villa Serin du Cap or the elegant house for their holidays, and who regularly come back here to enjoy the Cap's sun, the beach, the smiles, the kindness and the extremely good cooking of Jeannette and/or Melina. No roads to cross to reach the beach. Take the small footpath and you will find yourself on a gorgeous beach with an unobstructed view over the Northern Islands. The water is lovely. You will enjoy the quiet and beauty of the setting while being close to the hotels, restaurants, boutiques, nightclubs, diving centres, hypermarket, water sports, fishing, etc. For kite-surf lovers, Anse Laraie, one of the most renowned spots of the island, is 5 minutes away by foot. The Serin du Cap villa and the elegant house are decorated with taste and we are mindful of hygiene and cleanliness. We are regularly renovating to maintain our standing. The villa combines comfort, simplicity and security for an unforgettable holiday with your family or friends. The villa, with its 3 air-conditioned bedrooms and en-suite bathrooms, can accommodate 6 people. Baby cot or extra mattress available. For a larger number, it is possible to rent the elegant self-catering house on the same ground (see advert 674245). The house can accommodate up to 4 additional persons. The terrace of the Villa Serin du Cap is a pleasant living space and offers beautiful views over the sea and the islands (Coin de Mire, Ile Plate, Ile Ronde). A new private swimming pool on the right of the terrace invites you to enjoy rest and idleness! It is fenced: a relief for parents with young children. Barbecue area (with Weber grill) next to the terrace. You can bathe and grill at the same time during summer nights. For television lovers: flat screen TV and Canal Satellite. DVD player and Wi-Fi connexion for the Internet addicts. 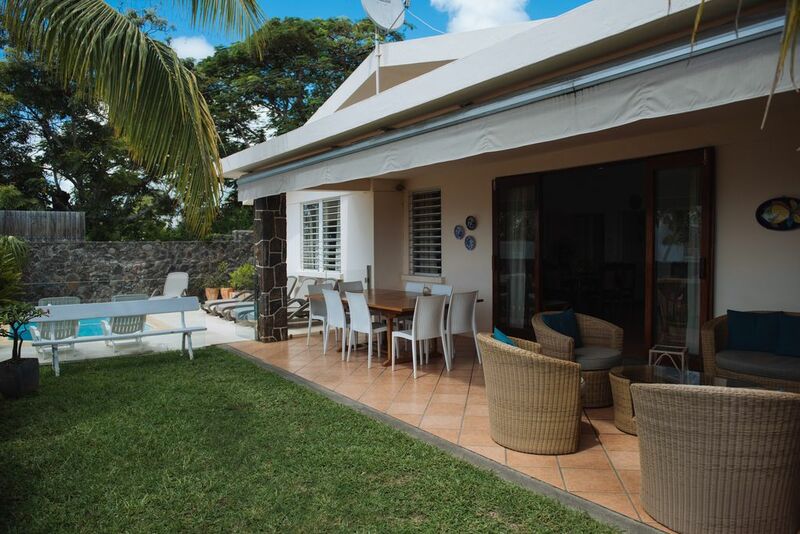 The Serin du Cap house, elegant, convenient and convivial is perfect for a couple with children or for two couples. It has two bedrooms, each with en-suite bathroom, double bed air-conditioning, and ceiling fan. Baby cot or extra mattress available. The terrace with garden view serves as a living room to fully enjoy our tropical weather. Deck chairs and Weber grill also available in the garden. The open-plan kitchen, fully equipped, has a TV corner and Canal Satellite channels, a sofa bed, a WiFi connexion. You will be won over by the greeting and the discretion of the housekeepers, Jeannette and Melina, who will let you taste a Mauritian meal on the house at your arrival. You will enjoy their local and varied cooking full of savours. Put your luggage down and let you be guided and pampered by them. They work from 9 a.m. to 1.00 p.m. every day (except Sundays and bank holidays) but are also available outside those hours for an extra cost. They know how to get you fresh seafood, tasty fish, how to prepare festive meals, babysit the children. Here, welcome is not just a word because we have customers regularly coming back here, some of them for 18 years! We go grocery shopping for you the first time, allowing you to recover from the trip. The villa and the house are entirely secured with an alarm system linked to a central. We are recorded by the Tourism Ministery. The garden is inviting, well-kept with flowers, and entirely fenced, which is a big asset for parents with young children. A welcome booklet gives you all the necessary information about the excursions as well as the important phone numbers. There is one in each property. Cap Malheureux is a typical fishing village. Early birds, go down to the beach and admire the pirogues leaving for fishing; the colours are dreamlike. You can walk on the beach along the coast. Do not forget to take the time to watch the sunset with your feet in the sand and an aperitif with accras and islands punch prepared by the housekeepers. The Cap Malheureux chapel, with its red roof (colour of the Flamboyant tree in summer), one of the most photographed sites of the island, is 3 minutes away by foot. Little shops and vegetable shops accessible by foot. Nearby, the Maison du Pêcheur to buy fresh fish, and next to it, a boules court. The bus stop is 50 meters away; therefore you can use it if you do not want to use a car. A car hire agency will deliver you a car at the house for a democratic price. We arrange, with no additional charges, the first groceries, the airport/house/airport transfers. Pereybere with a well stocked supermarket is 3 km away. Grand Baie, the hotels, boutiques, banks, restaurants, supermarkets, nightclubs, various water sports, etc is 6km away. Grand Gaube: 7 km. Mont Choisy: 12 km away. Port-Louis, the capital city, is 25 km away. The grapefruit gardens, the Labourdonnais Castle, among other places to visit, are located 15 minutes away by car. Born in 1953, married to Jean-Claude since 1975, mother of 2 and grandmother of 2 little boys. I have a long career in the administrative sector and I take a lot of pleasure managing our holiday rentals. I have always had a passion for cooking and truly enjoy meeting and sharing moments around a meal. The villa was built in 1974 on a land that has belonged to the family for decades. We lived in this villa at the beginning of our marriage but later decided to come only during holidays; the kids growing up, it was difficult to reconcile studies with the invitation to idleness inspired by this idyllic place. Therefore we decided to share this jewel with people wanting to know this country in a different way. We acquired our reputation through the grapevine and we met a lot of people and friends via theses rentals, not to mention that it allowed us to acquired experience in the hosting sector. We have always been renovating and improving the place for the pleasure of those visiting. We never get tired of raving about the view of the islands and of this turquoise sea that we can admire from the terrace. The lush nature, quietness of the garden, song of the birds are gifts constantly renewed. All we can do is enlivening all of this with our personal touch: our sense of greeting, sharing, and our desire to do things right. 3 bathrooms, each with shower and wash basin with hot water and toilets. Each bathroom is equipped with hair dryer, electrical outlet of 240 Volts. Linen and beach towels provided. There is also a fourth independent toilet. Fully equipped kitchen because I love to cook and to host! Second kitchen area for Jeannette. There, she makes her Mauritian specialities. A few books left by previous guests to share. A couple of board games: scrabble, dominos, cards. For more security, the pool is fenced. Despite the proximity of the beach and de sea, you can also enjoy the pool, the deck chairs, the sunshade and the beach armchairs as well as the exterior shower. In the utility room, separated from the house: washing machine, iron an ironing table available. First Mauritian meal graciously offered. Upon request with no extra charge, we do your first grocery shopping. Car hire deliverable on site. Airport/house/airport transfers. If you need a massage, go to Carine (the house behind ours). First up, we would stay here again in a heartbeat - it's that good!! Pre booking communication with Regine was really easy and even though we were not getting there until approx 8.30pm from the airport, the marvellous Jeannette was there to greet us with a delicious and ample dinner of Mauritian delights - catering perfectly for all of our dietary requests. Leftovers lasted for a few days - this was just the introduction to the marvellous service Jeannette and her sister Jeannine provided during our 3 week stay here, they will do anything for you and with great big smiles!! When you open the french doors in the morning to 'that' view, you know you are somewhere special. Access to the beach and then use of the pool is so wonderful and easy - close to Grand Baie but be aware that being the most northern point of the island, the travel times anywhere take awhile - be patient and take it all in. Take the time to get to know GB and what is has to offer - there's lots!! We shopped at Winners - nearby and Super U in GB - everyting you could want for your stay; ask J&J to cook for you if you can't be bothered, they'll whip up Gateaux Piments anyway!! A few people have siad that it's better than the pictures - it sure is - enjoy every moment in this island paradise!! Thanks Regine, Jeanette and Jeannine lfor evrything - see you next time!!! Thank you so much Tracy for your kind words! We are all so happy that you enjoyed your stay. We look forward to seeing you again at Villa Serin du Cap! help from Regine appreciated. We would recommend without hesitation and we will book for our next visit. Thanks so much Dee for this nice review! We are all so happy that you enjoyed your stay and we look forward to welcome you again in a not too distant future! Take care and best regards from our team! Now, this was a holiday ! nah, doesnt do it :-). The wifi is good for Kindle purposes but wasnt tested for film/streaming. We had a scheduled full network/incl 3G/4G power-outage over 6 hours during day time which had us McGyvering to hearts content. Top Vacation - would go back any day. Notre séjour du 05 au 18.11.2016 fut un avant goût de paradis, tant par la qualité de l'hébergement que par la chaleur de l'accueil et la disponibilité et l'extrême gentillesse de Jeanette et de sa soeur. minutes plus tard, Jeanette nous appelle dans la cuisine, et là, surprise! son livreur de poisson était là avec deux superbes langoustes frétillantes! Jeanette, c'est un rayon de Soleil! Merci de votre visite. C'était un plaisir de vous accueillir chez nous et revenez quand vous voulez! Recevez nos voeux les meilleurs pour Noël et le Nouvel. L'équipe de Villa Serin du Cap. Véritable petit coin de paradis! Tout était parfait, tant l'emplacement, que la maison elle-même où chaque détail est pensé et où nous nous sentons comme chez-nous. Jeanette, la femme de ménage, ainsi que sa sœur Jeannine, sont de véritables perles qui ont rendu notre séjour des plus confortables. Pour nos excursions et déplacements, nous avons aussi utilisé les services de Salim, le chauffeur, qui est très courtois et professionnel. Que dire aussi de Régine, qui est une hôte hors-pair! Pleine de gentillesse et de génerosité, elle mettra tout en œuvre pour que votre séjour soit des plus agréables. Bref, nous recommandons sans hésiter cette option pour des vacances à Cap Malheureux! Nice clean updated roomy house, with everything including beach chairs and umbrella. It started with a sign with our name on it at the airport, our transfer arranged by Regine, then we arrived to a well stalked kitchen, the first shop done by Regine just before we arrived. A lovely meal waiting with wine, prepared by Jeannette and a house kept spotless by Janine ( I think she even ironed my socks) you can pack light because Janine does laundry six days a week. These two are a beautiful addition to a property that is everything it was promised to be. The Serin du Cap villa is next to the sea, 40 m away from the beach. Access via a small private footpath arriving on a beautiful fine sand beach with unobstructed view over the northern islands (Coin de Mire, Ile Plate, Ile Ronde) and the beautiful sea. It is possible to walk along the coast to Pereybere or to the chapel of Cap Malheureux, one of the most photographed sites, which is 3 minutes away by foot. The Maison du Pêcheur (to buy fresh fish), little shops and vegetables shops accessible by foot. Opportunity to organize a private fishing game in the lagoon or a bit further with a local professional fisherman. Diving school nearby. For kite-surf lovers, Anse Laraie, 5 min away by foot, is a renowned corner. Boules court next to the chapel. The bus stop is 50 m from the villa. Small car hire agency nearby. They drop the car and take it back on site at an economical price. Grand Baie with its hotels, boutiques, banks, restaurants, casinos, night club, supermarkets, and departures for big game fishing is 6km away. Grand Gaube: 7 km. Mont Choisy: 12 km away. Port-Louis, the capital city, is 20 km away. The grapefruit gardens, the Labourdonnais Castle, the 'L'Aventure du Sucre' museum, among other places to visit, are located 15 minutes away by car. A noter que les tarifs sont a titre indicatif et bases sur un taux de change de 1 Euro = Rs 40. Ils peuvent donc être modifies en fonction du taux de change de l'Euro v/s la roupie. Il vaut mieux nous contacter pour un devis selon le nombre de personnes et la durée du séjour. les services d'une femme de ménage et d'une cuisinière sont inclus (de 9 heures a 13 heures tous les jours - sauf dimanches et jours féries). Elles sont disponibles en dehors des heures normales. Heures supplémentaires à la charge du client (environ 4 Euros/l’heure).